We are thrilled to welcome Katelyn Gallucci to TYPOLOGY as our curatorial intern for Fall 2015. For her first exhibition review, she visited Erin Stump’s new location on Dupont Street to see their inaugural exhibition. Past present FUTURE is a three-part exhibition co-curated by Kristen Weckworth and Erin Stump at ESP’s new 1558 Dupont Street location. The first exhibition, FUTURE, (closing October 10th) is a group show featuring work by Katie Bethune-Leamen, Fastwürms, Maggie Groat, Cameron Lee, Annie MacDonell, and Susy Oliveira. The exhibition creates a doorway into the ambiguity of the future by playing with dream-like memorabilia, fortune telling and the notion of finding through wandering. 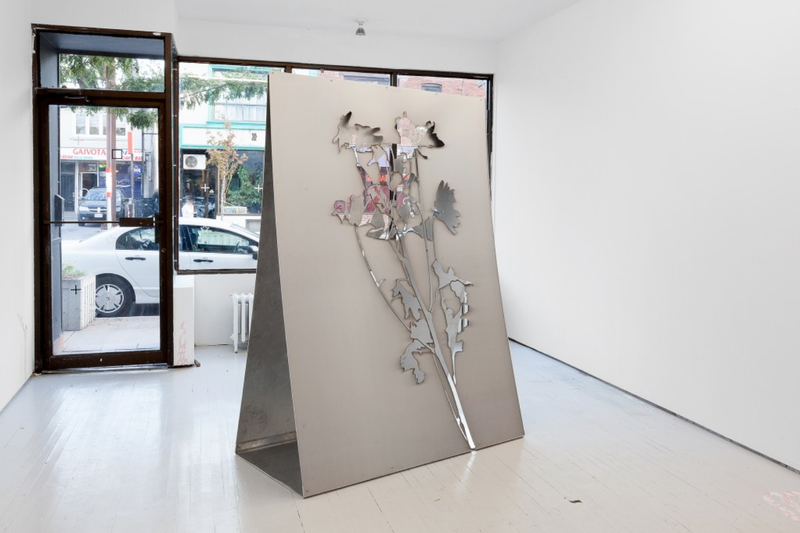 Upon entering the gallery you are welcomed by Susy Oliveira’s work, Greetings, a cut aluminum sculpture that has been folded in half to resemble a monumental greeting card. Daylight streams in from the opposing window, giving the sculpture an ethereal, dream-like quality. Walking further into the gallery you encounter Annie MacDonell’s work, The Fortune Teller, a video that documents the restoration of a cast resin hand from an arcade fortune telling machine. The piece simultaneously explores the collapse of time and its extension into the future. This contemplation is carried to the back corner of gallery where Maggie Groat’s work, 77 vision cards: marginal psychedelic, magnified and gathered ineffable, for direction, wayfindings, wondering, unseeables, wondering, outsiding, action reporting, future finds and interconnectivities is installed. 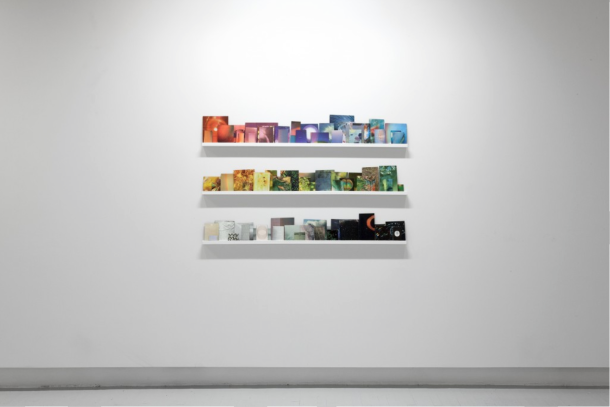 The cards consist of found images collaged onto salvaged cardboard, communicating the mysterious and meandering qualities that the future embodies. Each artist explores themes of the physical, intuitive and physic realms of time and space. The desire to collapse time and gain insight into the future is persistent in each of us. With anticipation and excitement, we wait to see what the future holds for ESP as it grows into its new permanent home. Katelyn Gallucci is an interdisciplinary photo-based artist currently living and working in Toronto. Recently she completed her thesis, titled Romantic and Impassive to earn her BFA in Photography from OCAD University. Exploiting the paradoxes of photography, she aims to investigate representation and how it relates to the human condition. She has exhibited at Artscape Youngplace in Toronto and internationally at Osaka University of the Arts, Japan. These and more images of the exhibition can be seen on ESP’s website.